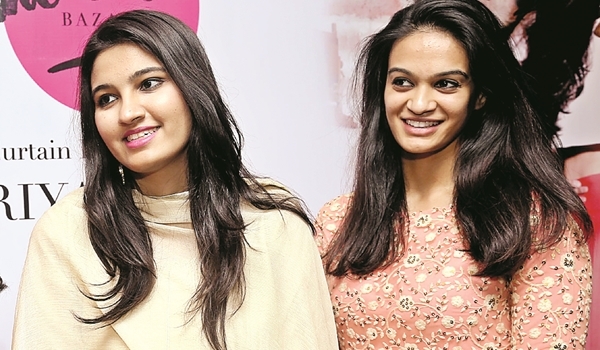 Young entrepreneurs and stylists, Anam Mirza, sister of ace tennis player Sania Mirza, and Tanya Rao are all set to bring a one of its kind experience for citya��s fashion connoisseurs through their maiden foray into designer wear exhibition – The Label Bazaar. a�?We wanted to change the monotonous way of hosting an exhibition in Hyderabad and The Label Bazaar will break the stereotype of having small stalls. It will be pop-up exhibition giving the city a fresh fashion experience,a�? says Tanya Rao. Anam Mirza adds, a�?The whole concept of Label Bazaar is to get everything under one roof. Clothes for a baby to an adult, the exhibition will have everything.a�? The one-day exhibition on February 27 will showcase works of some of the finest designers from all over India and abroad. Diya Rajvir, Pipa Bella, Aarti Vijay Gupta, Mishru, Masala Chai, Vedika M, Vaishali, Ridhi Arora, Love Quench, Nisha Sainani, Tenee Designs, Anmol Kakad, Yoube Jewelers, Diosa and Pink Mirrora��s collections will be displayed in the exhibition. The pop-up event will showcase jewellery, accessories, lehengas, tunics, anarkalis, saris, shoes, bags, clutches, party wear and casual wear.